Higher One is in trouble. The last 6 months have seen the once prosperous company hit near rock bottom and now they are included in their second federal inquiry in 6 months. Higher One also hired a Chief Compliance Officer earlier today. We initially reported on troubles with Higher One in an interview with federal authorities, and since the company is getting hit again with scrutiny. 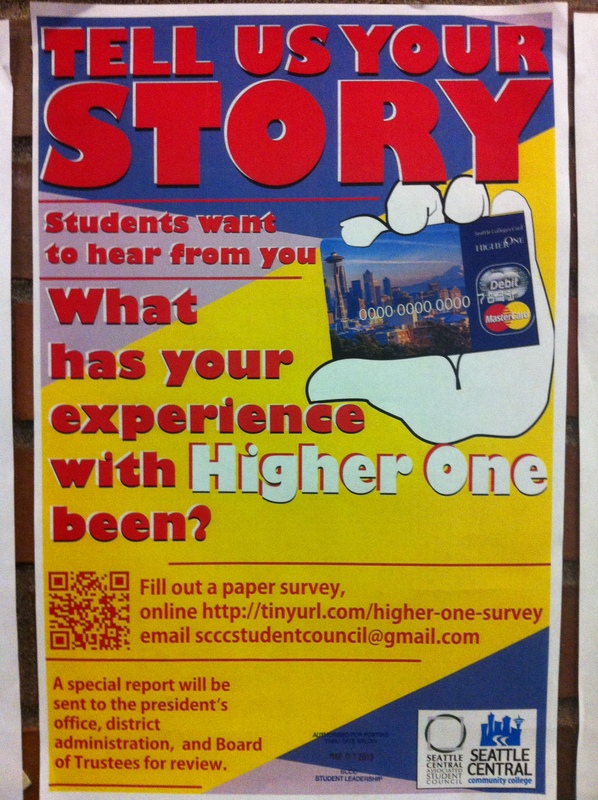 Higher One currently offers financial aid disbursement for the Seattle Community College District. On January 31st, the Consumer Financial Protection Bureau (CFPB) issued a press-release stating its intention to open inquiries into campus marketed financial institutions. The inquiry will measure “the impact of financial products marketed to students through colleges and universities,” says the release. Director for CFPB, Richard Cordray says the group will be looking “to find out whether students using college-endorsed banking products are getting a good deal.” Higher One’s media contact, Shoba Lemoine, says they “welcome feedback from students directly, or through the CFPB, on how we can best meet their needs.” The investigation will cover all campus banking options including the Higher One Corporation which drew criticism from student leaders at a recent meeting. At a January Board of Trustees meeting, charges were leveled at the bank, and they weren’t late fees. Najwa Alsheikh, Executive of Administration for Student Leadership at SCCC says students were often seen pulling out the maximum amount of $500 from Higher One ATM’s leading them to become drained at SCCC within only two days after winter quarter began. This forced students to use alternate ATM’s and accumulate fees. While some had to pay extra fees to get their money one student had an extra expense that no one wants. Hillery Jorgenson, Student President for North Seattle Community College says her friend was unable to pay rent on time due to problems with the institution leading her friend to pay a late fee on rent. The district currently has four Higher One ATMs with one per campus; the quick ATM drainage was pointed out prior to the quarter in an NCC article covering issues with the bank. Higher One ATM’s in the district were empty shortly after winter quarter started. Lemoine says this is an issue which will take a while to address. “In the very beginning of a partnership, we do estimate how much cash to load and it may take one financial aid disbursement cycle for us to evaluate how readily the machines need to be filled, because every student population on campus is unique in how it banks.” Higher One has been active on campus since summer quarter 2012. UPDATE 2/13: Lemoine tells NCC that Seattle Central will be adding another ATM in April due to “high usage patterns” on campus. Students affected by the tapped ATMs do have recourse and will not be left hanging, if they have the initiative. Higher One has agreed to pay back fees related to students who were forced to use outside ATMs but students must submit requests for the refund. Lemoine tells NCC, “we do have an ATM commitment policy which states that accountholders can be reimbursed up to $5 a day if our ATMs on your campus are out of service, money or not in order. Lemoine did not address covering the rent late fees. Higher One offers a low cost OPTION for students through its checking accounts. It is not mandatory, however. Students still have a choice to receive their financial aid refunds electronically deposited into the bank of their choice, or receive a paper check. Higher One streamlines this process so that students can have more options and can choose their option online with an easy interface. Prior to services like Higher One, students often only had a paper check option—not convenient or fast. Now students can get their refund directly deposited into their own bank quickly. The bank currently services 6,000 students within the district which is composed of about 35,000 students who receive financial aid, the district currently has about 45,000 students in attendance. The institution was implemented in the district to streamline financial aid disbursement but may have made a bad bet on the young company. In August 2012, Higher One was forced by the Federal Deposit Insurance Company to pay out a settlement of $11,000,000 to 60,000 students after the FDIC found, “that Higher One operated its student debit card account program (OneAccount) with The Bancorp Bank in violation of Section 5.” Section five covers deceitful practices. In 2011 Higher One made $142,500,000 from student financial aid fees, this totaled 80% of their annual profit. And while their pockets were being pulled out, another possession of theirs was trickling away. UPDATE 2/13: The above mention of 2011 annual earnings as 80% from students fees came from the U.S. PIRG. Lemoine tells us this number is wrong and that the company made “less than 50%” via student fees in 2011. In September during a national student press conference, we spoke with CFPB representative Rohit Chopra, who said the following of Higher One: “This institution was found to not necessarily be complying with all the necessary regulations to make it clear for students about what they were getting into.” The forthcoming national college articles would have a dramatic effect on the business. In November the company’s stock options shot downward reaching an all-time low in December trading at $8.81. The company had its highest trading day in summer 2011 at $20.99 per share but success was short lived. The company which began trading in summer of 2010 has been in its worst economic slump since the inception of the company as of November. NCC inquired with Higher One if a potential merger or acquisition would be forthcoming due to the loss but was not immediately addressed by Higher One reps. The company in an attempt to regain consumer confidence took steps to assure the future of the business. Encourage students to use financial institutions, since those with bank accounts can typically better manage their money, do not have to carry large amounts of cash, and can benefit from the convenience of debit cards and transaction records. Offer students the right to choose their banking relationships. Institutions should ensure that students have sufficient information available to allow them to be informed consumers. Encourage electronic refunds because electronic transactions are faster, safer, less expensive and more convenient. Comply with the U.S. Department of Education’s regulatory and administrative requirements for the Title IV federal student aid programs. Negotiate low or no fee options and convenient services for students. Educate students to be informed consumers of financial services, and publish clear and transparent fee schedules. Agree to a communication plan to ensure students are presented with a fair explanation of services. Select a financial services partner through a competitive process and engage students in the vendor selection process. Despite these outlines Seattle Central still lists the Seattle Colleges card (Higher One card) as the only timely means of financial aid disbursement and has not offered students the chance to pick their own banking information or does not list other refund options publicly. It does note receiving a paper check but only after prefacing it with students “may experience a delay in receiving their refunds,” if they elect that option. Higher One has seemingly made no public attempt at providing a “competitive process” for students when selecting banking. UPDATE 2/13: Lemoine contests the above statement saying that through the Higher One site (linked by SCCC) students can, “choose their “preference” or way they want to receive a refund. It is absolutely standard the way this is presented with all schools on the websites and students are given a clear option to have their refund deposited into the domestic bank of their choice.” This has not been vetted by NCC as we do not have access to their disbursement site but we will follow up when we can. In January 2013, Californian Congressman George Miller voiced his opinion saying he is “deeply concerned” with Higher One. And now in February the company will have some tough work ahead as they are under increasing scrutiny from the CFPB. Earlier today Higher One unveiled the new appointment of a Chief Compliance Officer to likely help with the company’s compliance. The stock roller coaster isn’t over for the group as the Seattle Community College District is grabbing feedback from students, which one student rep says has been almost entirely negative. Whether their business will remain economically viable is anyone’s guess but Higher One’s future in Seattle is seemingly crumbling away like the Alaskan Way Viaduct. The banks could not get away with burdening its customers with hidden administrative fees, so thought, hey let’s go after the seemingly, unknowing college student who attends a financially-strapped educational institution and propose an easy fix to long financial aid lines and excessive paperwork. Which begs the question: Why trust the banks when THEY had to be bailed out of its own muckety-muck? Perhaps, implementing a group membership for students at a credit union where each student would be issued a personal student ID number, as well as a separate number that the college administration could access would help the college track the total financial aid disbursem, while maintaining the itemized personal expenditures of the student. No privacy law s would be violated. Maybe using a disclaimer of any funds not being used for educational purposes would be subject to a small administrative fee. I’m no accountant, for sure, but I would consider this as an option.